RRJ: Some people can tell you the exact day and time they realized their need for Jesus’ gift of atonement. You two don’t have a moment like that because you’ve both looked to Jesus for as long as you can remember. Why is that and do you ever wish you had a “moment of salvation”? John: I have been blessed to have godly people in my life since I was young. Seeing the way they acted and reacted to situations in life had a big influence on me. In my younger years, I didn’t think so much of looking to Jesus or the influence of the Holy Spirit as much as I didn’t want to suffer consequences of getting in trouble. Now I realize how God has been working on me. It is true I do not have a moment of salvation, but I do have a journey of salvation. Mitzi: For as long as I can remember, I have always gone to church. Jesus has always been there so I don’t have that moment of salvation like a lot of people. Sometimes I do wish I had that moment because it might be easier to share my testimony with others. My life has had its ups and downs and I have gone astray at times, but my constant has been to turn to Jesus. RRJ: Since you two have been walking with the Lord for such a long time, is your Christian life as close to perfect as one can expect this side of Heaven? John: “Perfect” in my view is not sustainable. While at times I feel “in sync” with the Lord and his plan, other times I feel off track. It is in those moments I realize my selfish nature taking over and I am living for me. But a lot of prayer and slowing down to listen can be of great comfort. Mitzi: I’m laughing because I am certainly not perfect and will never be. I try my best to always put Christ first in everything I do, but there have been many times when I have fallen short. RRJ: For sure, the sanctification process of becoming like Christ through the Holy Spirit is a life-long journey as you learn to implement His redemption in all areas of life. 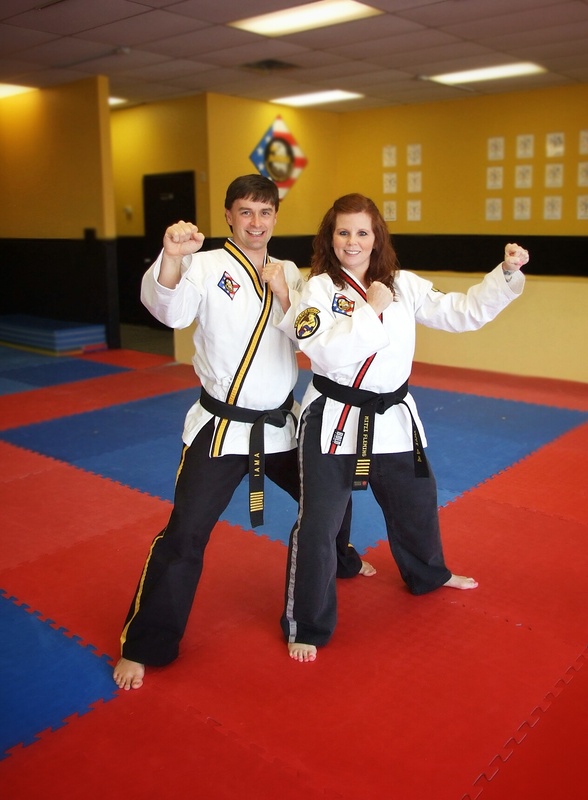 One area that’s unique to your lives is that you’re business partners at Fleming’s Martial Arts. Many people might wonder how a husband and wife can work so closely together in a business environment. Has that been difficult for you? John & Mitzi: We do get questioned quite a bit about how it is to work with each other. The majority of the time, we work very well together; we both have our strengths and weaknesses and compliment each other very well. Sometimes we have contrasting ideas and opinions, but it takes communication to work things through. We have been married for 19 years and know when we are getting agitated with one another and need to take a time out. RRJ: At Fleming’s Martial Arts you work with children as young as three years old all the way up to senior citizens to teach them what you call “Fitness with a Purpose”. How is your Christian faith revealed in your work with both young and old? John: Christ has set the supreme example of showing love. While he knows each individual’s situation, we do not. My goal each day is to make a connection with as many people as I can and put a smile on their face. Mitzi: I want to shine a light on everyone that walks through our door, young and old. John does the majority of the teaching. I am the program administrator, so I am usually the first person they see when they come into our school. I make it a point to greet everyone with a smile on my face and ask our students and parents how their day has been. Sharing and reflecting Christ’s love is my goal and purpose everyday. RRJ: Running your business and offering classes during the day and night, as well as raising your two teenagers, means you live very busy lives. Yet, you’re still involved in your church and in serving the community. Why is making that commitment important to you? John & Mitzi: We strive to put Jesus first in every aspect of our lives and to lead by example. We feel called to get involved and connect to people even if it’s out of our comfort zone. Relationships are important and through relationships, we are hopeful to bring someone to Christ. RRJ: Finally, what’s the one thing you would say has encouraged you most to live out your faith beyond church walls? John & Mitzi: The possibility of connecting someone to Christ through work, missions, or our daily lives encourages us the most. It’s all about pointing people to Him! Read 1084 times	| Like this? Tweet it to your followers!